Strangeship | Spaceship! Spaceship! Spaceship! This is an older build by the talented Damien Labrousse, but caught my eye for its really daring design. It’s entirely asymmetrical, with one side dominated by a big fin and the engine block; whilst the other has a smaller fin and gun/sensor pod thingy. I know from experience that these asymmetrical designs are harder to do than they look, as if you get it wrong the model seems lop-sided and doesn’t look like it would actually function. Here Damien has used bright yellow sections on both sides and contrasted wings at right angles to help give something that whilst asymmetrical is aesthetically balanced. 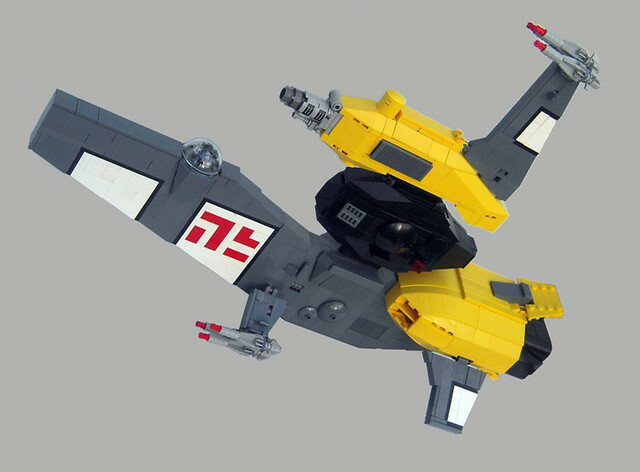 The build also reminds me strongly of the work of Nnenn, who made dozens of these kind of esoteric ships and I think would have approved especially of the weird alien symbols cunningly brick-built into the wing.